Enjoying a lovely cup of Robois tea, listening to jazz fm , and thinking of what to make for lunch. The idea of creating a new recipe, by experimenting gets me excited. 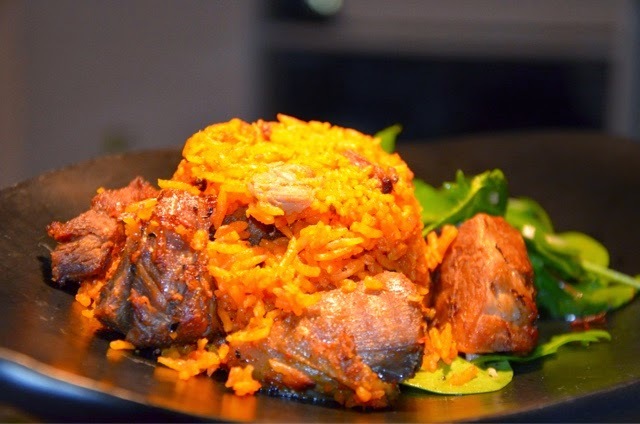 A quick dash to my fridge and larder helped my decision on making Buka Jollof rice with Lamb Kleftiko. 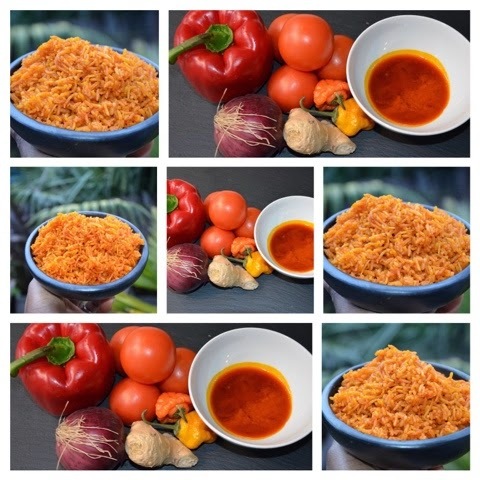 Buka is a slow cooking rich tomato, Palm oil and pepper stew, synonymous with Nigerians. My previous post has the recipe for Buka stew, which is the base for this recipe. 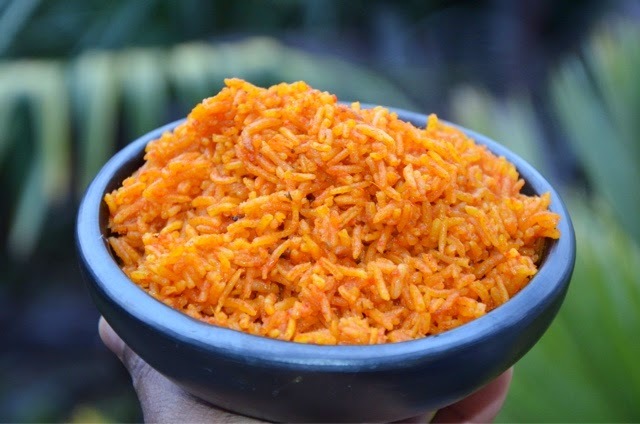 The secret to a perfect Jollof rice is to use less water, cook gently on a low heat and allow the rice to cook in it's own steam, something a clay pot with it's lid offers. Alternatively you can bake it in a casserole dish or use any sauce pan, kitchen foil and a tight lid to seal the steam. 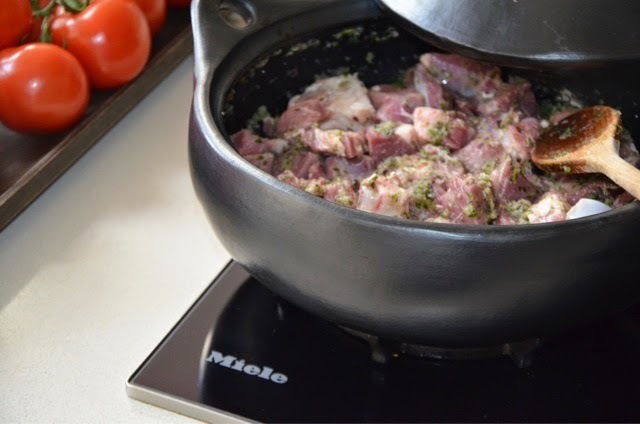 Kleftiko, (stolen Lamb) is a Greek way of slow cooking lamb in herbs in a sealed earthenware pot. 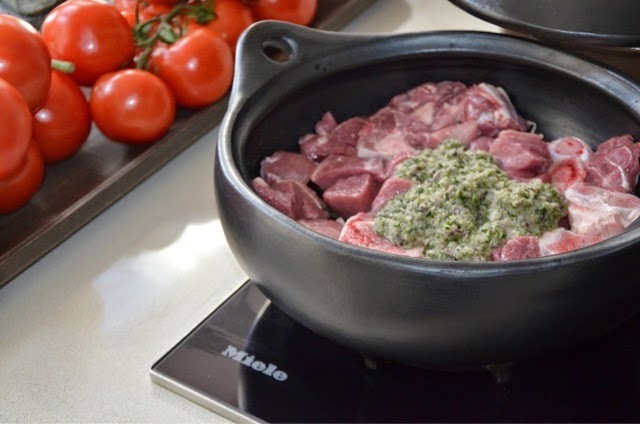 This process allows the lamb to cook in it's own juices with an end result of moist, tender and tasty lamb. A casserole dish with foil and it's lid will also work for the lamb. 2 cups of long grain rice or basmati rice washed and soaked for 15 minutes. I like to soak my rice as this takes some of the starch away ( a secret process to get fluffy and separated rice) and cuts your cooking time in half. 1 cup of chicken, vegetarian or beef stock. 1 vegetable or Ham stock cube. Place a clay pot on a medium heat and add the Buka stew. Once warmed through add the washed and soaked rice and mix well. Cook the rice and sauce for about 10 minutes making sure you stir to avoid any burns. 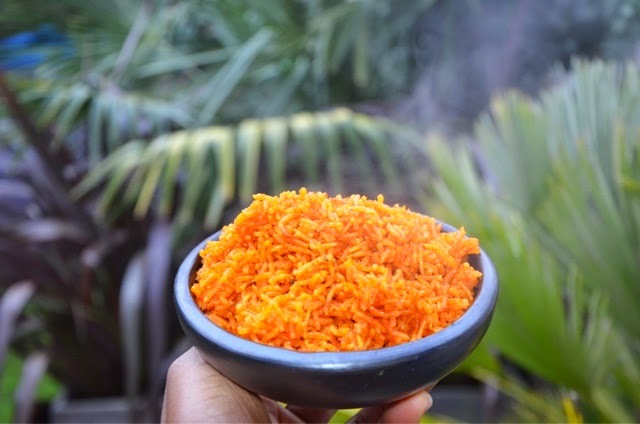 Once the rice is coated in the Buka stew, add your preferred stock. Stir and cover with the pot's lid or if using a saucepan cover with the foil and lid. Turn the heat down and cook gently for half an hour. Remove from the heat and leave the rice to steam in it's own juices for a further 10 minutes. 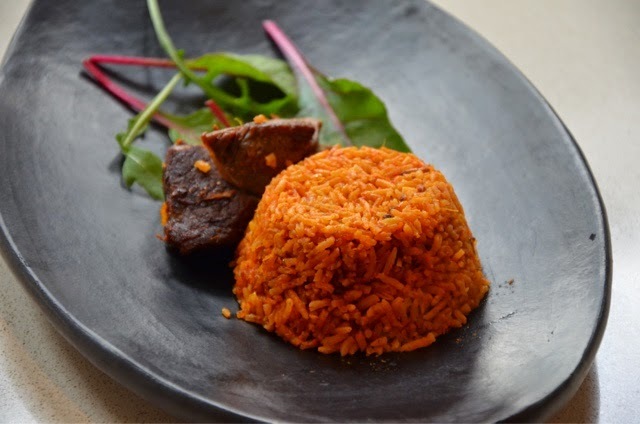 Your Jollof rice will be fluffy and El dente ( having a slight bite), and ready to serve. 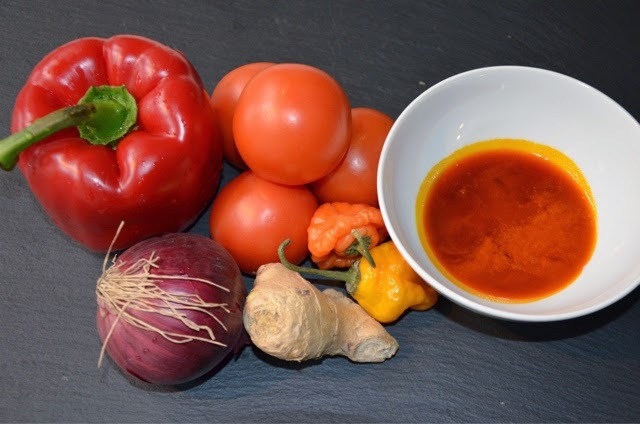 In a blender add the ginger, garlic, chilli, oregano, thyme and your preferred stock cube. Add a little of water and blend to a thick paste. Add the mixture and lemon juice to the lamb and mix well. Marinade the lamb in the fridge for a minimum of 4hrs or preferably overnight. Place your clay pot of lamb in the oven and cook for 40 minutes. Once cooked remove from the oven and leave it to rest for 5 minutes. Separate the lamb from it's juices to a bowl. Add the lamb juices to the Jollof rice and mix well. Then add the lamb pieces and mix well. Pour the rice in a serving bowl with your preferred salad. Watch with amusement as everyone will be rushing to get their fair portion of meat and rice. Enjoy! Madam, thanks for the great recipes. I recently got introduced to your blog by a friend. All foodians must rejoice, lol. Btw, can you recommend a specific brand of clay cookware that could be purchased in the US?